Monica Bell is an Associate Professor of Law at Yale Law School and an Associate Professor of Sociology at Yale University. Her areas of expertise include criminal justice, welfare law, housing, race and the law, qualitative research methods, and law and sociology. Monica Bell is an Associate Professor of Law at Yale Law School and an Associate Professor of Sociology at Yale University. Her areas of expertise include criminal justice, welfare law, housing, race and the law, qualitative research methods, and law and sociology. 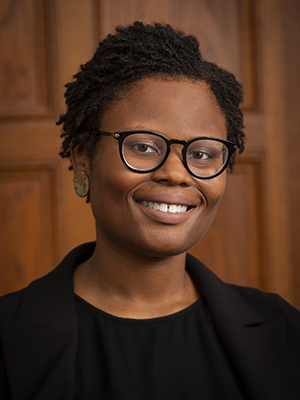 Some of her recent work has been published in The Yale Law Journal, Law & Society Review, Social Service Review, and the Annual Review of Law & Social Science. She has also published work in popular outlets such as the Los Angeles Review of Books and the Washington Post. Before joining the Yale Law School faculty, Bell was a Climenko Fellow & Lecturer on Law at Harvard Law School. She previously served as a Liman Fellow at the Legal Aid Society of the District of Columbia, where she worked on matters related to cash assistance to families and disabled adults, child support, unemployment insurance, homeless services, healthcare, and other legal and policy issues affecting low-income women and families. Bell clerked for the Honorable Cameron McGowan Currie of the U.S. District Court for the District of South Carolina. A first-generation college graduate from South Carolina's Upcountry, Bell holds degrees from Furman University (Truman Scholar), University College Dublin (Mitchell Scholar), Yale Law School, and Harvard University.